Where: a parking lot to be determined. Join us for a special event to thank supporters of the Sunshine Fund before the 2014 Blue and White Game. Enjoy some snacks and beverages on us. Flip through a binder full of the records we’ve obtained. Be a Sunshine Fund watchdog and review our bank statements to keep us on the level. And sing along to a playlist chock full of sunshine songs. 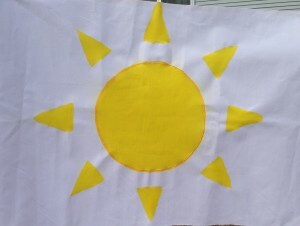 We’ll set up first thing in the morning, so look for the tall Sunshine Flag that will mark our location. Keep an eye on Twitter, Facebook and your e-mail for details about where we are.